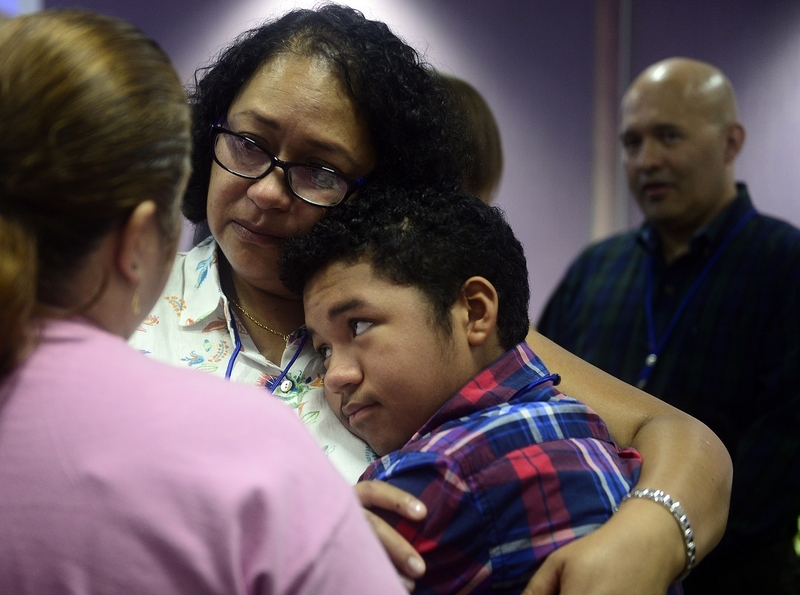 Hartford — Politicians, physicians and attorneys came together Tuesday to fight the impending deportation of a Colombian man whose son, affected by a rare genetic disease, is contributing to national research. Julian Rodriguez and his longtime partner, Diana Cortes, came to the United States on tourist visas within six months of each other in 2000. They tried to get asylum from their country’s violence — a lengthy process — but were unsuccessful. The government has issued Rodriguez multiple stays of removal since 2009 because of the treatment his son needs and because his son and Cortes participate in National Institutes of Health studies, his attorney, Glenn Formica, said. But earlier this year, U.S. Immigration and Customs Enforcement sent a letter to an old address of Rodriguez’s — he only got it because he keeps in touch with the homeowner — alerting him to an upcoming meeting. During that meeting, officials told him to purchase a one-way ticket to Colombia. Formica and Rodriguez aren't sure what triggered the letter. Rodriguez, who's scheduled to depart Sept. 12, is hoping for another stay of removal before then. Rodriguez and Cortes moved to New London after staying just a few months in New York City. Rodriguez began working with a government-issued tax identification number and the pair had their son, Santiago, in 2003. At Tuesday’s conference at the Connecticut Children’s Medical Center, Physician-in-Chief Dr. Juan Salazar said he met Santiago when Santiago was 4. The child had an unusually severe infection, Salazar said, and doctors believed an immunodeficiency was to blame. Doctors diagnosed Santiago with chronic granulomatous disease, which affects just four to five people in every million, when he was 6. Santiago’s condition worsened as he got older, Salazar said. So when the National Institutes of Health, or NIH, offered Santiago a chance to get an experimental bone marrow transplant — a complex and lengthy procedure that could have resulted in death — “Santi very bravely accepted,” Salazar said, using the boy's nickname. Santiago is 14 now and six years removed from the transplant. Complications from the procedure mostly have subsided, but Santiago continues to visit NIH every six months and visits the Children’s Medical Center every two to three months. “Common sense tells me that keeping Santi here is in our national interest,” Blumenthal said. U.S. Rep. Joe Courtney, D-2nd District, said the law doesn’t require the government to deport Rodriguez, who has not been convicted of any crimes. He said the country’s ability to care for Santiago with cutting-edge technology is “America at its best” while its work to disrupt “groundbreaking research that will benefit many kids in the future” is the opposite. “We cannot allow that contradiction to stand,” he said. Rodriguez and Cortes didn’t want to go public, but said they now have no other choice. Both said they’re nervous about whether the effort will bring a positive outcome as it has in other cases in Connecticut and beyond. Formica, Rodriguez’s attorney, has filed a national-interest waiver on behalf of Cortes, which would allow her to stay and would convey some benefits to her husband if accepted. In the meantime, Formica said, he is asking ICE to allow Rodriguez to stay and look after his family. Santiago, a rising sophomore on scholarship at a Catholic high school who plays basketball, soccer and the drums, asked the public to help his family stay together. “I don’t know what I would do without my dad,” he said. “He’s helped me through so much in my life. It doesn’t seem fair. He has paid his taxes. He follows the speed limit."